This blog post is a part of the whole Batch Mode series, which can be found at the Nikoport Batch Mode page. This post will focus on some of the initial limitations of the Batch Execution Mode on the Rowstore Indexes. Please consider this as something that is absolutely expected to change in the future releases, and even though in some cases I seriously ask myself if the fixes will come rather late then soon, I still expect them to solve them all. – The Index Scan iterator which would kick off with the Batch Mode, eliminating potentially a huge improvement of the data processing, should our tables have a huge number of rows. Do not get me wrong, there were some stuff that I know and do not to put here, and there must have been tons of details that unless we become programmers at Microsoft – we shall never find out, but I consider those 2 pieces to be the biggest blocks in the implementation. 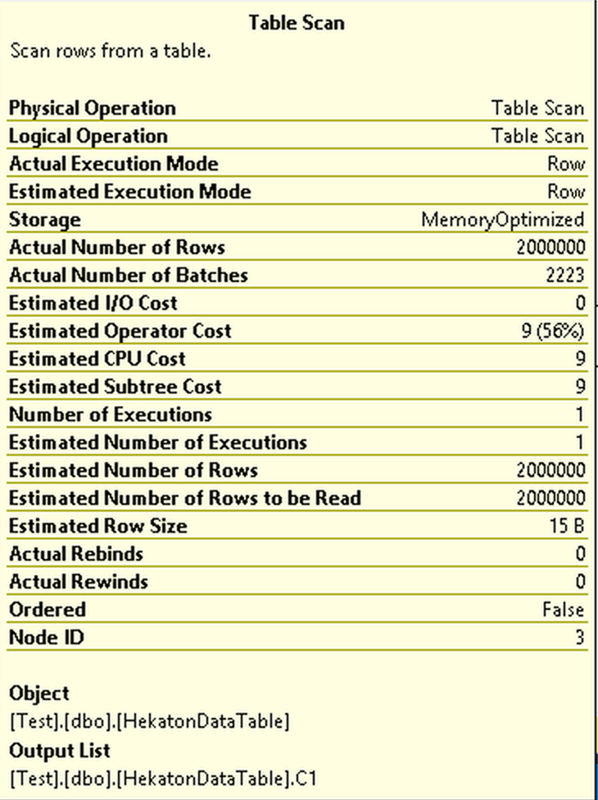 We have already seen how Batch Mode can successfully turbo-charge the queries and improve them, I have also shown at Batch Mode – part 2 (“Batch Mode on Rowstore in Basics”) an example of TPCH query, making the Batch Mode over the Rowstore Indexes to perform significantly slower, and in this blog post, let’s consider a couple of more scenarios where things do not go exactly the way we expect them to go over, by default. Everything is shiny – this is the standard we expect to have, if running a similar calculations against a single table, right ? While both Compute Scalar & Hash Match iterators run in the Batch Execution Mode, the Table Scan of the dbo.HekatonDataTable is being executed in the Row Execution Mode, like if we would apply an old hack against it by joining an empty table with a Columnstore Index. The amount of the performance lost will be proportional to the amount of data that is stored in our In-Memory table and it does not really matter if the table is a persisted or a schema-only, to my understanding we won’t be able to escape the traditional slow Row Execution Mode process for data extraction from the In-Memory table and we shall have to pass through the adapter converting the rows into batches for the later Batch Mode execution. This penalty is nothing extraordinary in its nature, but still a rather disappointing situation, given quite honestly the lack of love and investment that after initial 2 releases that In-Memory technology has received. I do not expect this fix to appear rather fast, but in the end, for the consistency there will be a need for it. One of the very important points here is that it is enough just to search for the data in the LOB column in order to avoid the Batch Execution Mode, you do not have to aggregate on it – and this will be a very big factor for some of the installations I know, where just a simple message column defined with a wrong data type will do a huge damage by not allowing the Batch Execution Mode to kick in. I do not expect this one to be solved quickly and this worries me much more then just In-Memory tables. XML ? What on the planet Earth do you mean by that, Niko ? Now, in the age of JSON, who cares about the XML ? SELECT  SUM(C2.value('(/root)', 'bigint' ) )/2. The execution plan has got it all … The Table Valued Functions, UDX, Stream Aggregates, etc. The only thing missing is the Batch Execution Mode and it ain’t coming back home. While I am not the biggest fan of XML, it is a still very much needed format and its support should be implemented. It is not as high on the priority list as the LOBs but still pretty neat thing to have. You did not expected it, did not you ? Nope. Like in the case with Columnstore Indexes. At this point we are back to the TPCH drawing board and the query 19 is still here to stay - giving us some of the most incredible headaches, and not because the Batch Mode is not enabled in it - it is. The problem in the query above is that the Bitmap Filters are executed at the very late stage, after processing the regular filters, with all the rows being directly read from the dbo.part & dbo.lineitem tables - contrary to the Rowstore Indexes with the Row Execution Mode and being different to the situation of the Columnstore Indexes. Strings are "kind of evil" and the Batch Mode is not their best friend, especially right now. If you are looking to test your workload right away with CTP 2.0, while working with a lot of strings (and oh so many Data Warehouses do that), please consider waiting a little bit before making a final decision, you will not regret it. I have been told by Microsoft that this is one of the issues that is being worked on and that it is very much expected to be resolved before the RTM of the SQL Server 2019. The limitations of the Batch Execution Mode on Non-Columnstore Indexes is mostly based on not-Rowstore data sources and their scans. There are some noticeable exceptions, such as LOBs, and they should be kept pretty much in mind. Mostly those limitations are delighters, and not getting an extra snack is not the same as getting almost entire one. Given that Microsoft expects the String Filters to get a significant improvement before the RTM, I feel pretty much comfortable looking into the future. While of course, those perky LOBs, disabling the Batch Execution Mode are nothing short of being fine ... But I am a believer that this limitation will fade away in a relatively near future. (I have no such feedback/information from Microsoft, but I see a huge potential in the massive text processing that will eventually gain its space on SQL Server & Azure SQL Database). The bottom line is to remember that the feature is called Batch Mode on Rowstore (and if you are not using Row Storage, you are most probably out of luck).